I hope you all enjoyed the holidays! It's hard to believe we are in 2016. I'm ready to tackle a new year and see what adventures 2016 will bring! LOFT is having MAJOR sales right now. All sale styles are an extra 60% off! This Knit Turtleneck Tunic was $44.50 and is currently marked down to $14! It's so soft and the perfect tunic length. 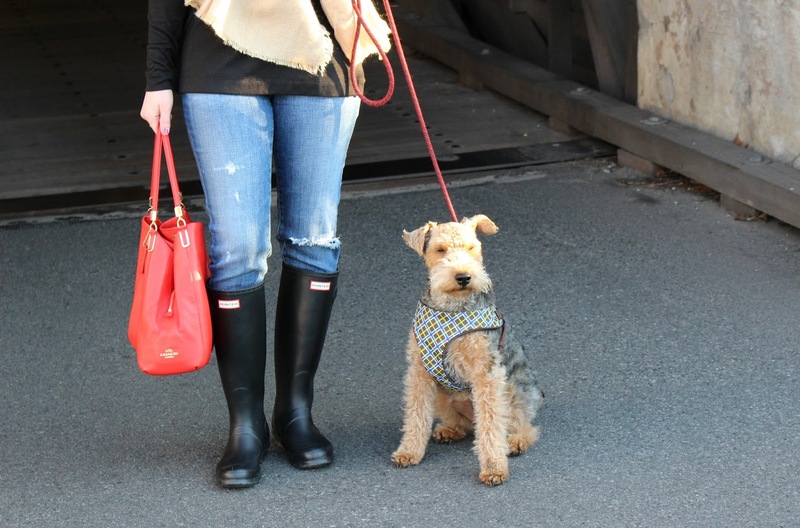 It's also great for layering or dressing up with accessories! All sizes are available and it comes in a few color options! I accessorized this turtleneck tunic with an oversized scarf and simple monogram necklace. I recently got this BP. 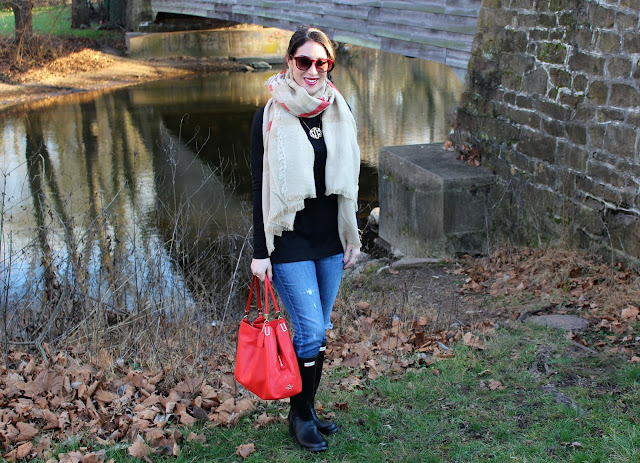 scarf from Nordstrom for around $11. 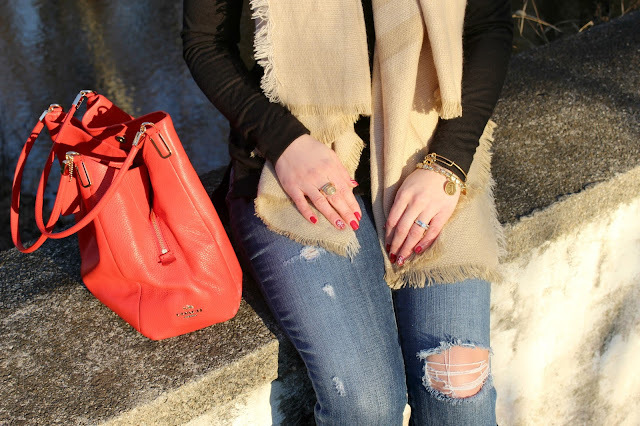 I love the tan with a pop of red! My favorite part of this outfit is my new black Hunter Rain Boots! 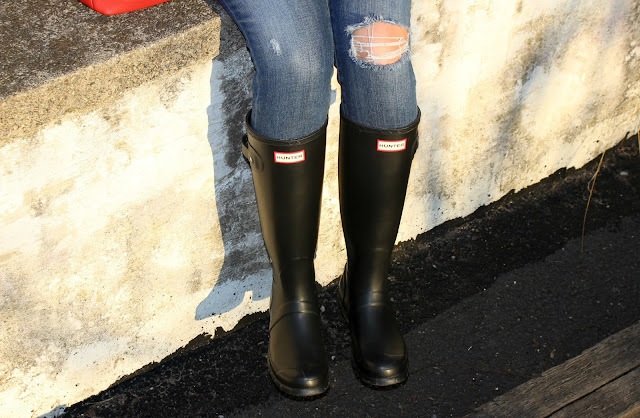 My mom was shopping at Costco in the fall and noticed a crowd of ladies around the shoe section, She was shocked to find that there were Hunter boots for sale! She bought me this pair for my birthday and got a great deal on them! I've gotten so much use out of these boots already since it's been a rainy winter around here. They will come in handy when it finally snows, too! 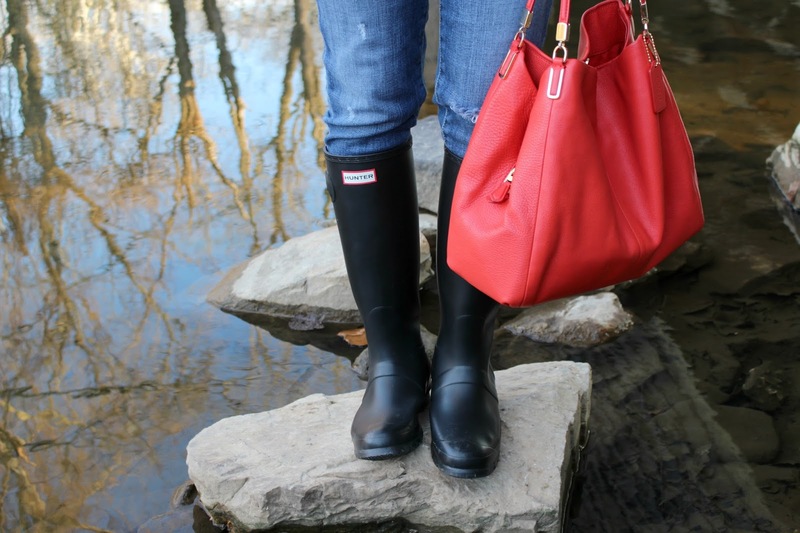 You can shop these exact Hunter boots at Nordstrom. For reference, my shoe size is 7.5 and I'm wearing a 7 in these Hunters. They only run in whole sizes, so size down if you are in between! 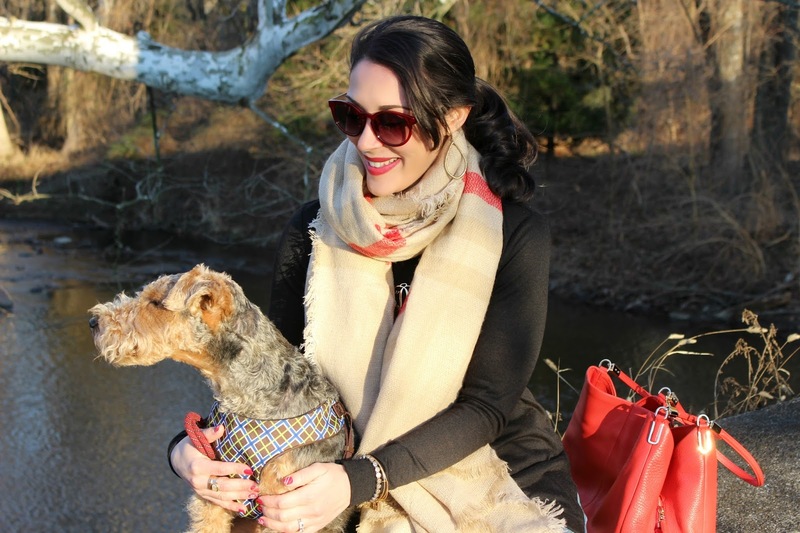 For jewelry, I accessorized with my gold Alex and Ani initial and monopoly dog (on sale!) bangles and a stretch bracelet from LOFT. I also wore my new "go to" Silpada earrings and ring. 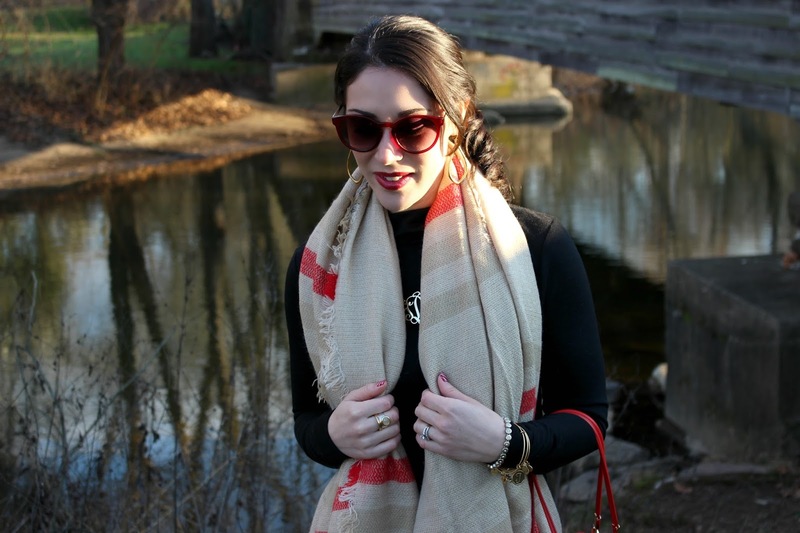 Lately, I'm loving gold jewelry and how nice it looks with the color red! This red Coach shoulder bag was a Christmas gift from my mother-in-law. 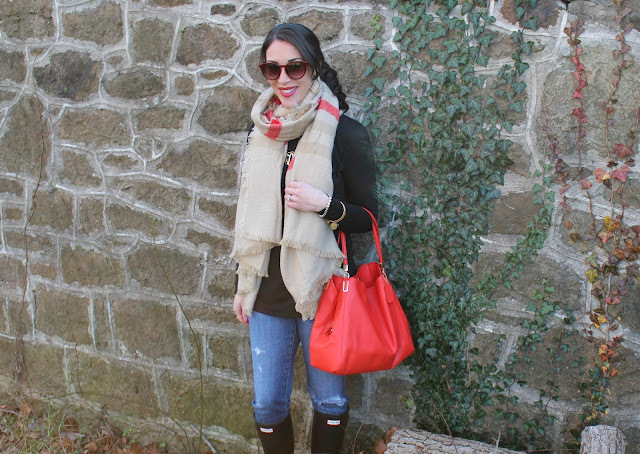 I adore it and it looks fabulous with this scarf! She got this bag from the Coach outlet. You can find seriously good deals there, so if you live near one, check it out! 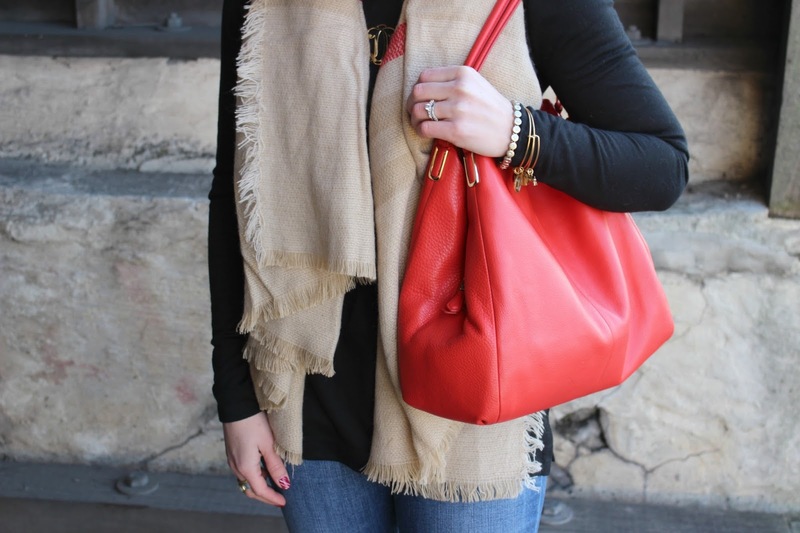 This slouchy bag has three compartments- two large open compartments and one smaller zipper compartment in the middle. Here is a very similar version of my bag on Coach.com. 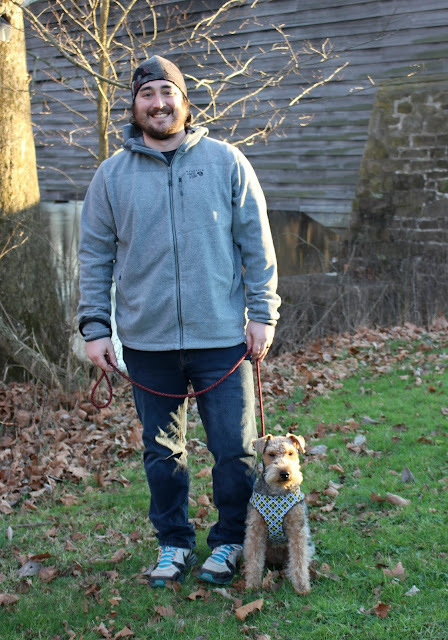 Here's my photographer and our dog, Jax! Shop Todd's Mountain Hardwear Hooded Jacket for the man in your life! 2 Corinthians 5:17, "Therefore, if anyone is in Christ, he is a new creation; the old has gone, the new has come!"